Minor-key Mozart constitutes the thematic glue for this week’s Boston Symphony Orchestra program. The bill opens with his Piano Concerto No. 24 (K.491), one of two Mozart piano concertos in a minor key. (The BSO programmed the other one, No. 20, just last week.) It concludes with the darkest of all Mozart compositions, the Requiem, a piece that’s been haunted by ghost stories ever since its completion — or rather, its incompletion. Written and premiered in 1786, K.491 is unusual in a number of other ways. It calls for oboes and clarinets, plus horns, trumpets, and timpani — the largest orchestra Mozart gave a piano concerto. Its first movement, like those of Nos. 11 and 14, is in 3/4. It begins and ends in C minor, the only Mozart piano concerto to finish in a minor key. The Allegro’s foreboding chromatic initial theme seems to anticipate Don Giovanni, which premiered the following year, and when the piano enters, after two minutes, it doesn’t restate that theme but rather reflects sadly on it, as if giving voice to one of Giovanni’s conquests. I was taken aback by Nelsons’s less than forceful opening. It was scrupulously sculpted, but mellow enough to have come out of The Marriage of Figaro rather than Don Giovanni. All doubts were allayed, however, when his 71-year-old soloist, Romanian pianist Radu Lupu, entered. With weighted, thoughtful phrasing, Lupu created a long arc out of the Allegro; like Menahem Pressler, who played No. 27 with the BSO last November, he knew exactly where he was going and was in no hurry to get there. His immaculate passagework never called attention to itself, instead nestling into the orchestral framework. When he had to hop around in the bass, he did so without thumping. His cadenza, too, was an unostentatious exploration of ideas; there was no virtuosity for virtuosity’s sake. The E-flat Larghetto is a study in simple beauty, and Lupu gave the songlike main theme a beguiling innocence, as if he were thinking of Zerlina. Here the piano is set mostly against the winds, which in the C-minor and A-flat middle sections chime with suppressed sorrow. Again like Pressler, Lupu was so unaffected, he made performing Mozart seem like child’s play. The Allegretto finale, back in C minor, actually was child’s play, since Lupu and Nelsons turned it into a delightful toy march. The movement is structured as a theme with eight variations, and here each variation had its own character. The third soared, Schumann-like, with passionate support from the orchestra. The winds maintained a steady tread in the fourth; Lupu brought starlight to the fifth. Everything danced as well as marched, and that set up the final variation, where Mozart changes the time signature from 2/2 to 6/8. This thought-provoking performance of No. 24 came from a soloist and conductor abiding on the same page. It was less dark and dramatic than some interpretations, leisurely but never limp. Lupu was so quiet in his chair, so bereft of physical flourishes, at times he seemed invisible. His music spoke for itself. He didn’t get anywhere near the ovation Mitsuko Uchida received for No. 20 last Thursday, but I enjoyed his Mozart a great deal more. As is well known by now, Mozart did not live to finish the Requiem. And there’s no want of titillating stories surrounding it. We’re told the commission for the piece was delivered by a mysterious messenger, perhaps Death himself. Mozart inferred from this visit that he was being commissioned to compose his own Requiem Mass. He didn’t finish it because he was poisoned by his arch-rival Antonio Salieri. (That hypothesis is developed in Peter Shaffer’s 1979 play Amadeus, and the subsequent 1984 film adaptation.) Or he was poisoned by his associate Franz Xaver Süssmayr because Franz Xaver was having an affair with Mozart’s wife, Constanze. What we know of the truth is more mundane. Mozart did receive, in July of 1791, a commission to compose a Requiem Mass. The messenger, impersonating Death or otherwise, was probably Johann Nepomuk Sortschan, a law clerk for a Viennese attorney. The commissioner was certainly the attorney’s client Franz Count von Walsegg. Walsegg’s wife had died earlier in the year, and he wanted to give her a musical memorial. Whether Mozart, as his health deteriorated, saw the Requiem as his own musical memorial is difficult to say. Walsegg’s was not the initial presentation of the Requiem. In January 1793, it was given at a benefit concert for Constanze and her children arranged by one of Mozart’s patrons, Baron Gottfried van Swieten. Part of it appears to have been played at Mozart’s memorial service. To her death, in 1842, Constanze maintained that the Requiem was her husband’s. Neither Süssmayr nor anyone else who might have helped with the work’s completion ever contradicted her. However much the Requiem may be Mozart’s in conception and spirit, the fact remains that he didn’t write down every note of it. At the time of his death, he had completed the Introit and made a full sketch for the Kyrie, the Sequentia (with the exception of the Lacrymosa), and the Offertorium. The Sanctus, the Benedictus, the Agnus Dei, and the Communio were still to come. To what extent Mozart left sketches that would have guided Süssmayr is a question that has vexed scholars for more than two centuries. A number of musicologists and composers, among them Boston Musical Intelligencer adviser Robert Levin, have made their own alternative completions of the Requiem, in some cases incorporating a sketch for a Mozart Amen fugue discovered in the 1960s to finish the Lacrymosa. 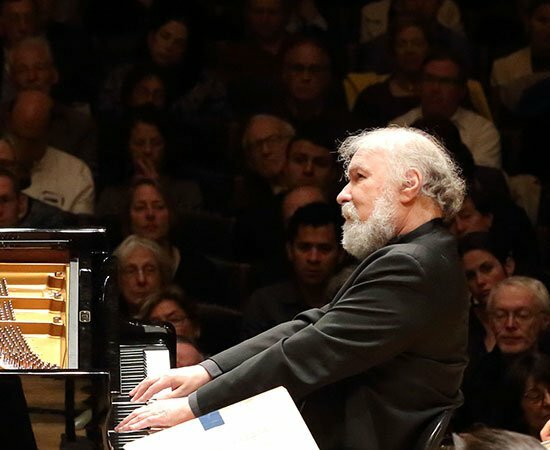 But the familiar Mozart/Süssmayr score remains extremely popular, and that’s what Nelsons performed before a packed Symphony Hall Thursday. He also chose to use, as he did for February’s Bach B-minor Mass, a modest orchestra and a large chorus. Performance practice in the Requiem is variable. On his 1991 AliaVox recording, Jordi Savall leads an ensemble of 50 (orchestra, chorus, and soloists) in an intimate, dry-eyed interpretation that zips by in 46 minutes. At the other end of the spectrum, Karl Böhm on his 1971 recording for Deutsche Grammophon takes a stately 64 minutes with a chorus that, by the sound of it, must have included every able-voiced resident of Vienna. 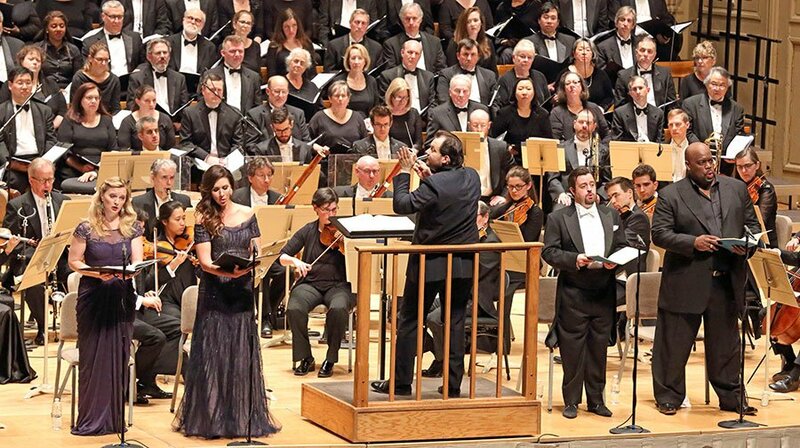 Nelsons had an orchestra of close to 50 and a Tanglewood Festival Chorus, under guest conductor James Bagwell, of 127 — even bigger than the chorus for the Bach. Like his B-minor Mass, Nelsons’s Requiem was fervent rather than prayerful, running just 49 minutes, with huge contrasts in dynamics and tempo. Like the Mozart concerto he’d just performed, it wasn’t particularly dark, even though the score calls for only lower winds (basset horn and bassoon) and forgoes the French horns. The opening “Requiem aeternam” was gorgeous if otherwise unsurprising, with the TFC singing on book and Nelsons taking the decibel level way down for the “luceat eis.” The soprano, Lucy Crowe, brought rays of sunshine, if not a plethora of consonants, to the “Te decet hymnus.” It was a reverent, gratifying start, but Nelsons then tore into an imploring Kyrie and followed that, the TFC hardly having a chance to catch its breath, with a Dies irae that inspired fear and trembling. That was the pattern for the rest of the performance. A big Rex tremendae and a powerful Confutatis were offset by a hushed, slow, swaying Lacrymosa and a serene, celestial Hostias. The Domine Jesu flew like the proverbial bat out of hell; the Sanctus was awe-struck, the Agnus Dei turbulent. In a Requiem where the soloists don’t have a whole lot to do, Nelsons’s foursome did it well enough. My favorite of the lot was the mezzo, Tamara Mumford, whose rich voice just kept blooming. Crowe was earnest throughout, pleasing, a little strained at the top of the Lux aeterna. Bass Morris Robinson started the Tuba mirum with depth and resonance; he grew less resonant in the course of the evening, as if his voice had tightened up. Tenor Ben Johnson had the best enunciation; he was effective singing on his own but tended to get swallowed up as part of the quartet. Enunciation from the TFC wasn’t as crisp as it had been in the B-minor Mass, but it didn’t seem to matter. It’s the chorus that talks to God in the Requiem, and this chorus, at Nelsons’s behest, had plenty to say, now pleading, now demanding, now repentant, now just plain hopeful — all the while insisting on its promised right to salvation. The fugues were energetic and extroverted, particularly the “quam olim Abrahae promisisti” that Mozart places at the end of the Domine Jesu and repeats after the Hostias, as if God needed reminding of that promise. Thursday’s audience, on the other hand, needed no reminding of the excellence of this performance. Nelsons, Lupu, and the BSO will repeat this program Saturday April 22 at 8 p.m.
Radu’s restraint was familiar from his Mozart recordings. From first-balcony right, mid-hall, the horns were inaudible, the oboe’s prominent part regretably not first desk. In the Requiem, the chorus size rendered the strings inaudible. The review is admirably accurate aside from the Uchida slur. If I ever have a million dollars to waste, I am going to offer a prize to a music reviewer/program annotator who can accomplish three near-impossible tasks: a description of Beethoven’s 7th that does not quote Wagner, one of Mozart’s Requiem that does not mention Amadeus, and a third to be named later (nominations welcome). I fear it will go unclaimed. Sam, here are a few others: “Autumnal Brahms”; John Williams described as owing a debt to Prokofiev; “Brilliant but eccentric Glenn Gould”; “Honey-toned Itzhak Perlman”; “Maverick___________(fill in your preferred maverick. e.g. Andrew Rangell, Gidon Kremer); the antisemitic Wagner, etc. Sometimes what appears to be a slur is just a tie, for notational convenience. I too fhought it was unfortunate that the reviewer found it necessary to disparage Uchida in order to praise Lupu. An invidious comparison, at best. >> He didn’t get anywhere near the ovation Mitsuko Uchida received for No. 20 last Thursday, but I enjoyed his Mozart a great deal more. The fuller house of audience was not able to applaud louder than a week ago. Most of them probably did not like the slowness of the last movement particularly, not eccentric slow but boring slow. I don’t care about Uchida, but her performance was better. I have been very generous with my praises regarding Nelsons’ conducting for a couple of seasons. It is hard to believe I have to genuinely speak of his concert negatively, in a row. The long string strokes in introitus are meant to push one’s emotion level to higher. Nelsons wanted clarity from a large chorus. He raised their voices and swamped the strings completely. that was unforgivable. (he string balance did come back a little better in the end.) This problem stayed for the entire requiem. Convincingly due to HIP influence, the pace of Kyrie ad Dies irea was insanely fast. The strings were not prepared for that and they even choked very briefly in Dies, a few bars into the acceleration. The tenor’s tuba mirum was far from enjoyable. One should expect someone with high born honorable manner like Don Ottavio in the captian’s death scene. the tenor sounded more like the opposite. The mezzo’s smile at Nelsons (and audience) was easier to spot than her voice, when the soprano sang. Person taste, I did not like the timbre of the bass either. I left for home with an empty feeling. It was like you tried to throw a full blow at your target but you missed it, emotionally. Sam tries to be funny again. I always think he may do better. I see this as an attack on the great genius Wagner once again. Why would one think an ordinary music pundit would share anything truly insightful, or have anything truly insightful to share? W/o Wagner shedding light on Beethoven symphony’s music image, vast majority of the audience would still be in the dark. I also thought that the chorus swamped the strings throughout. I don’t know if I’d call the Kyrie and the Dies irae insanely fast, but there certainly should have been more difference between them, which means that the Kyrie should have been slower. It is marked Allegro, the Dies irae is Allegro Assai; I think they were both closer to Molto Allegro, or even Presto Agitato. It was clear that Nelsons wanted a big, dramatic Requiem, but his approach worked against his purpose, because it was too big and loud to be clear, and there was not enough differentiation in dynamics or tempo for it to be expressive. I quite liked the Tuba Mirum, though, because it sounded like an operatic quartet by the master of the genre, and provided a welcome relief. Suggesting that audiences would not grasp the nature of Beethoven’s 7th without being enlightened by Wagner’s nostrum is a bit of a stretch. Every commentator from the very beginning has noticed that it is an intensly rhythmic work, and Wagner doesn’t add anything to that. In fact, his attempt at elegant language goes astray; it is rhythm, but is it dance rhythm ? Any dance accompanying the Allegretto would have to be a very slow and stately one, and it’s hard to imagine anyone dancing to the finale, though it would be amusing to see them try. Wagner called it the Apotheosis of the Dance. An apotheosis occurs when a mortal is raised to the ranks of the gods. I know Wagner was fond of conferring immortality on things, beginning with himself, but does this really make sense ? The Dance was mortal until Beethoven’s 7th made it immortal ? It’s hard to believe that this is a great revelation without which ignorant audiences would clash by night. It’s good to read, though, that Thorsten thinks I can do better. I’m always glad when we can agree on something.